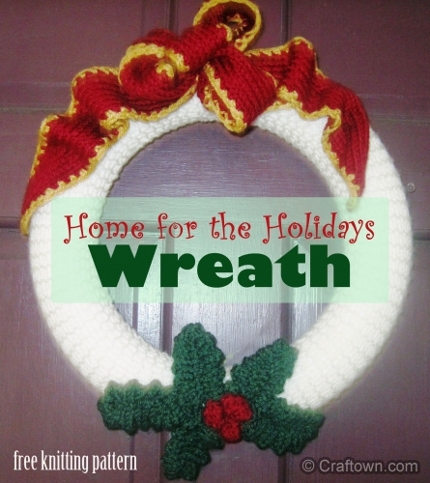 If you’re one of those people who starts thinking Christmas in July, you’re sure to enjoy this easy — and easily customizable — pattern for a knit holiday wreath from Craftown. Designed by Melanie Smith, this project uses a foam ring as the base, which is covered with garter stitch and accented by a knit ribbon and holly leaves and berries. Change the colors and leave off the holly and you’d have a cute way to decorate with knitting throughout the year. I might skip the white yarn if I were going to hang it outside, as well, but either way it’s a cute handmade addition to your holiday decor. HaHa. I was pushing the stroller and toddler in this very humid midwest evening and was thinking of…”need to knit a wreath for the holidays..” Great minds think alike!